Lou Sandoval is co-founder/co-owner of Karma Yacht Sales, the Lake Michigan Beneteau dealership based in Chicago. It’s a full-service dealership offering new-boat sales, brokerage and service. Sandoval, 48, is on the board of the Yacht Brokers Association of America and he is vice chairman of the diversity committee of the Recreational Boating Leadership Council. 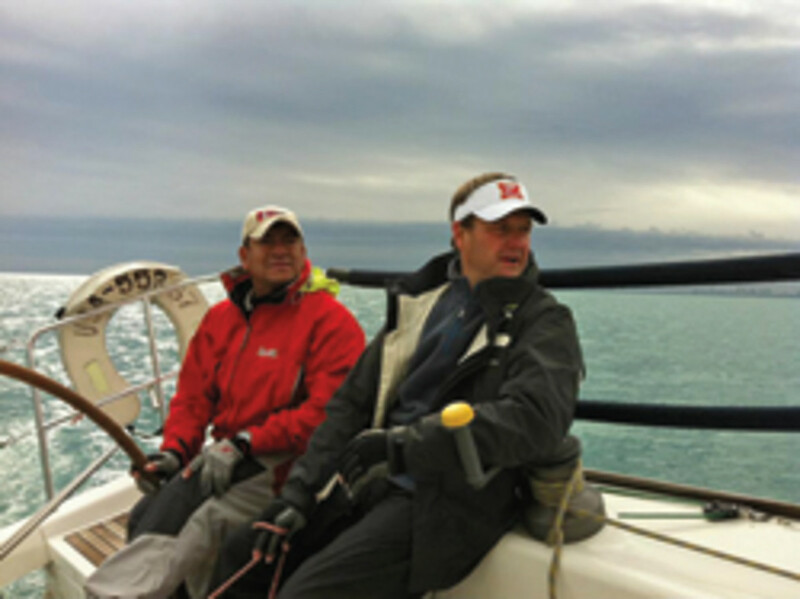 He is a board member at the Chicago Yacht Club and chairman of the venerable Chicago Yacht Club Race to Mackinac. Growing up on the South Side of Chicago, Sandoval fell in love with boating while earning a sailing merit badge at the Owassippe Scout Camp in Michigan. He credits Scouting for giving him foundational exposure to the sport of sailing, which among other activities shaped his love for outdoor recreation. Sandoval’s early professional career in the biomedical industry took him to the Pacific Northwest, where he sailed Puget Sound and the Pacific Ocean. He was later transferred to Miami, where sailing year-round became the norm for this transplanted Northerner and he became more deeply involved in the racing circuit. Sandoval moved back to Chicago in 1997 and jumped headfirst into the sailing community by purchasing his first sailboat — a 27-foot 1978 AMF Paceship — with two friends and his brother. He joined the Chicago Yacht Club and joined many of its committees in order to help promote club membership and the sport of sailing. In 2000 Sandoval and two boat partners purchased their first new boat — a 2000 Beneteau First 33.7 — and named it Karma. He’s now on his third Beneteau, his second First 36.7. He races it in the largest one-design fleet in North America, one that Karma Yacht Sales helped build on Lake Michigan. “I am as passionate about the brand as the first day I learned about it,” he says. Q: Karma Yacht Sales was born in 2002 after you and your business partner, Jack Buoscio, purchased the established Beneteau sailboat dealership (Darfin Yachts). Since then you have increased new-boat market share for Beneteau to more than 34 percent. How did you accomplish that, and are there lessons for other dealers/brokers in your business strategy? A: As newcomers to the industry we focused on building the brand name of Karma Yacht Sales and having that be synonymous with top-tier customer service. Our belief is that anyone can sell a boat one time. The true art comes in turning customers into repeat buyers, where each customer becomes an annuity. Over the past 10 years that has been our focus and it has paid off. We have been recognized as perennial winners of Beneteau America’s President’s Award for sales and service. In 2011 we were recognized as Service Dealer of the Year, with a perfect Customer Service Index Score of 100 percent. We are proud to say that many of our sales come from repeat customers who are on their third or fourth boat. Keeping them happy in their purchase has provided strong referrals to clients’ colleagues and friends. Q: What do you see as the largest hurdles to growth today? Lack of time? Competition from other activities? Cost? The perceived complexity of learning to sail? All? A: As a father of a 4- and a 6-year-old, I’m very present to the challenges that your average two-income American family go through. Soccer games, after-school activities, birthday parties all seem to cloud the family landscape and put a premium on time. All that being said, I’m also present to what supporting these other “pastimes” costs. When you factor in a three-child family — the piano lessons, the Little league and the soccer leagues and camps — you are talking about a composite outlay of about $8,000 for a season that lasts roughly as long as our six-month boating season in the Northern regions. Quick math will show that this sizable expenditure is well above what it would cost to go boating during that same period of time. I propose the notion that people will spend money and dedicate time to what they are most passionate about, so it really isn’t totally focused on time and cost. Our job is to ignite that passion. None of the activities I’ve described previously allow a family to truly participate together and commune. Soccer and baseball have you drive the kids to practice or games and sit on the sidelines. They play; you watch. There is little total family engagement. Boating is an activity that the whole family can participate in together. It allows you to get away from the electronic entrapments of our day-to-day lives and relate to one another. At our very human essence we are a communal species. Boats are a vehicle that helps us relate to one another in a setting that helps us build memories. A portion of what sailing suffers from is perception. As a sailor and businessman I’m ever protective of the image that sailing has in the lay press and general media. How many times have you skimmed the pages of a financial magazine and seen an ad for a financial investment firm with a mature couple on a sailboat? The financial services industry has captured the nautical image to symbolize financial security — something you purchase in your golden years — the pinnacle of financial accomplishment. The message that has been ingrained is that boating is best left only for those that “have it.” It furthers the perception that the sport is expensive and unobtainable for young families. The vested interests have to recapture control of this image and redirect it as an outdoor sport that the whole family can participate in — a multigenerational sport. Q: You recently returned from the American Boating Congress in Washington, D.C., which included sit-down visits in the offices of the nation’s lawmakers. Why do you think the face-to-face meetings are important? And how important is effective advocacy at the national and local level to the growth of our industry? A: We live in a challenging business climate. Federal, state and municipal governments of all types are struggling to draw revenue to provide some of the basic services that were once funded by property tax and personal income tax. Their revenue model was based on a presumptive increase. As home values struggle to improve and private-sector unemployment continues to remain high, this places a “target” on the business sector. The perception that we are a “recreational” industry and consequently might be less important is one that we need to continue to educate legislators on. We are all ambassadors for the recreational boating industry. • Stand and be heard: This is a mantra that I learned at an early age, and it’s one that the marine industry needs to adopt. For example, at ABC during our various conversations many legislators were surprised to learn about the fact that recreational boating was a $121 billion industry employing upwards of 963,000 Americans and supporting thousands of small and medium-sized businesses. Looking at our labor statistics, it has been said that for the national unemployment rate to remain constant or decline our nation needs to be producing upwards of 330,000 jobs per month. In my opinion, helping them understand that any adverse move (be it legislation or otherwise) on an industry such as ours impacts that national goal. Bottom line to them: It’s votes that they will lose. • Paint the picture: All stakeholders need to understand what our average boater looks like. We have to be knowledgeable in the facts and figures if we are to broaden the appeal and combat stereotypes. For example, despite the characterization that boating is a sport of the wealthy, for three out of four boaters their mean household income is less than $100,000 annually; 63 percent of boaters make less than $75,000 per year. General media often focuses on the smaller percentage of boaters. How many stories did you see about Steve Jobs’ new yacht or Larry Ellison’s fleet of boats? That is such a small aspect of boating that we allow to define all the average boaters. It pains me to pick up a sailing magazine and read a review on a $1.5 million custom-made boat as the feature article. It makes me scratch my head and wonder whose side they are on. The average boater is often a teacher, a fireman, a small-business man and a kid from the South Side of Chicago who never thought he’d be where he is today. That is the story we need to continue to tell. • Politics is everyone’s business: If you look up the word politics in the Merriam-Webster dictionary, you’ll find: “the total complex of relations between people living in society”. A “complex of relations,” yet we’ve all been conditioned to the three things you don’t discuss — politics, religion and money. Now I’m not saying that we take each opportunity to engage in the partisan warfare that seems to dominate today’s political spectrum. As business owners, we need to work with all sides. They need to understand us as much as I need to understand them. We need to focus on the eight or nine things we agree on, not emphasize the one or two we don’t. Boaters are a community, as I’ve said previously; we need to speak to the points of what boating is about. As business owners we need to stand proud in the fact that we are the front line in our nation’s economic recovery — always have been, always will be. Some of my best conversations on Capitol Hill were with lawmakers on both sides of the aisle that get what the small-business owner goes through because they came from that background themselves. Regretfully, that is a small percentage of Congress, but for the rest they won’t know if we don’t tell them. We need to continue to engage them and speak up. We also need to work within our various industry associations to highlight the key issues that impact us all as a whole. 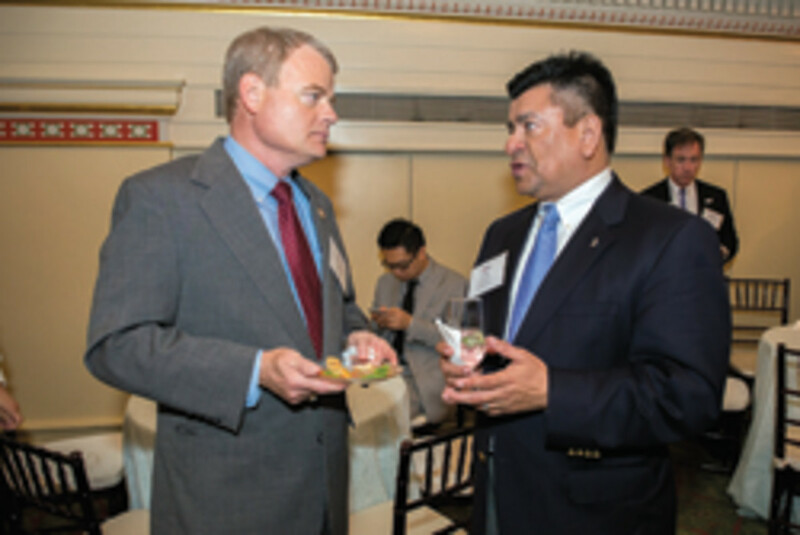 We have political action committees that look to support the key issues facing the industry. The PACs support legislators that support us, regardless of ideology. The boating community needs to support those groups with our time, our financial resources and our talent. For business owners and company representatives, these provide the voice and the anonymity needed. Every other industry utilizes this model. It’s time that boating adopts it, as well. Q: The industry drumbeat for the need to grow boating has never been louder. You specialize in the sailing end of the market. Talk about the particular challenges facing the sailing industry and how you work to overcome them. A: As far as sailing is concerned, I spoke to the perception challenge earlier. One of those perceptions is that sailing is difficult. I think there is far too much emphasis on sailboat racing as an avenue to recruit newcomers to the sport, and this approach helps feed the perception of difficulty. Let’s take running, for an example. If all we did is focus on marathons it would seem as too daunting of an undertaking for the average person that might be remotely interested in running. Running a marathon is something that people evolve to after participating for some time and becoming proficient (and conditioned). Sailing is no different. For people that take the sport on later in life, the skill sets needed to get out on the water and become proficient to the point of being competitive are oftentimes a barrier to participation. To address the perception, we’ve offered [American Sailing Association] instruction included in the purchase of the boat. This helps build any confidence issues that a sailor might have in the operation of their new boat. In the offseasons we offer open houses with specialized speakers that come in to help cruisers with topics like sail trim, navigation, basic diesel engine repair for the DIYer and weather. We started this practice the first year of owning the business. No one was doing these at that time. Now many of the boatyards do these open houses, as well as some of the other brands on the lake. Imitation is truly the best compliment, but it’s an idea that has caught on and that’s good for the sailing community. Q: How important is new product to growing the market today? Talk a little about the changes in the product line that have made it easier to attract new sailors and also keep existing sailors in the fold. A: In general, I think the sailing manufacturers have been slow to embrace innovations in the design of the boats. There are a few exceptions to that statement. However, sailboats have remained relatively unchanged for a long time. We’ve made them lighter and faster, but outside of marine electronics there have been far and few changes to engines (hybrid technology) and power systems (to include OEM-offered solar energy components). We were all on a good trajectory, and then the economic freight train known as the Great Recession hit many manufacturers, forcing them to cut back on production. Sailing has been a bit slower to come out of the slump, but there have been glimmers of light through all of this. We have the benefit of representing the largest production boat brand — Beneteau. That “title” gives the brand a bit of flexibility in trying new things. As they roll out new designs they all incorporate new features that improve upon the sailing platform. Some while ago they were one of the first to offer vertical battens in OEM roller-furling mains. This improves sail performance, yet maintains ease of use for cruisers. The Dock & Go [system] was innovative and offered flexibility in docking the boat. Other brands have adopted variations on this theme, as well. This helps two groups — the newcomer in helping build their confidence and the participant on the other end of the spectrum who might sail shorthanded or lack the mobility to jump off boats. If the net result is that it keeps them sailing or sailing longer, that’s a good thing. The Beneteau brand was able to keep these innovations going throughout the economic downturn, which gave them an advantage over other brands. Q: As a member of the diversity committee of the Recreational Boating Leadership Council and being of Hispanic heritage yourself, discuss the importance of diversity to the long-term health of boating. It appears that we are just getting started on this important goal of reaching new audiences. A: Coming from a Fortune 100 mindset I found it very interesting how insular the marine industry has been to broadening its appeal beyond the traditional buyer profile. I view diversity as the “ad,” if you may, and “inclusion” as the true action that we are working toward. It is mission-critical for the marine industry to attract and develop younger buyers, more women, differing perspectives and a broader range of ethnicities. It doesn’t just come from the buyers; we also need to diversify our work forces within the industry. Plain and simple, that’s just good business. My business experience comes primarily from the 17 years I worked in the medical products industry. We learned long ago that in order for companies to better connect with the changing demographic of their buyers, their field sales organizations had to evolve to become more inclusive. Buyers are more apt to buy from representatives that understand the values of their culture and their particular use of the product being sold. The medical industry started with the front-line sales teams and carried on into management (at all levels) and operations. This practice started over 25 years ago in many consumer products sectors. The marine industry has a bit of catching up to do. Inclusion is, in part, awareness and action. In our defense the marine industry never really had to reach out beyond their traditional buyer demographic. Since recreational boats are generally considered a non-necessity, you could debate that it wasn’t necessary to broaden the appeal. Our country is changing. It isn’t until we are faced with the factual evidence of the changing demographic of the United States. We operate in a more globally oriented marketplace, and the facts that the buyer demographic who so often supported boating over the past four and a half decades has a flat to declining birth rate and increasing age are all indicators of a need to alter course. The good news is that we now recognize it and have some good examples of efforts conducted in other industries to change their course of action. There really isn’t a need to reinvent the wheel — rather [we need to] fine-tune these efforts to the boating community. It has to start at the manufacturer level. It needs to become a part of the way companies do business. It should be reflected in a specific brand’s marketing, from the photography they use in brochures to groups with whom they choose to collaborate. I gave the example at the recent RBLC meeting of Harley-Davidson, which is also considered a luxury recreational brand. Almost nine years ago the management at H-D recognized that their market position was slipping and the forecast for the future did not look good. Rather than continue to push the image they had, they made a calculated effort to rebrand themselves and sell the freedom that comes with riding a Harley. They found that this “freedom” transcended all buyer and market segments. They focused on targeted affinity collaboration with the market segments they needed to grow in. A couple of weeks ago, they released the results of their efforts. For the fifth year in a row they have seen double-digit growth in women riders, riders aged 25 to 35, African Americans and Hispanics. There are many pearls of wisdom in this case for the marine industry, yacht clubs and other boating stakeholders. I look forward to the day that I am no longer the first or only Hispanic member of any group. I recognize the impact that being a pioneer in anything symbolizes, yet I am also present to the responsibility that comes with that pioneer position — the responsibility of educating groups on how to attract a broader buyer demographic. Perhaps this is why I’m so vocal about this issue. Q: Social media has become an increasingly important tool for communication, sales and staying in touch with customers on a variety of topics. What are some of the ways you use social media at Karma Yacht Sales, and what should others in the industry know about its benefits? A: I’ve always been inclined to stay ahead of some of the technology issues. I understand that many existing industry professionals might not know where to start. I would recommend that if they don’t have the in-house talent (a son or daughter in that age range), then they should hire a young person with those skills or seek a consultant in this area. I’ve seen a lot of approaches in different marine ventures trying social media — some good, some not as much — but I recognize that at least they are trying. We utilize Facebook, Twitter, LinkedIn and Pinterest to further the brand image and help promote the sport of sailing. We have an independent hashtag that we promote, #getbusysailing, to help build awareness about the sailing lifestyle on Twitter and across platforms. It’s been great to see it grow over time. Twitter and Facebook have become primary news sources for a lot of millennials, so getting our word out through those avenues is good. Some of our followers, or fans, are global in nature. It’s always interesting to see the numbers on where our content is shared, and by whom. Social media is all part of how our industry needs to stay relevant. Here’s a neat anecdote: In 2007, as the media/communications chairman for the Race to Mackinac, I launched the Facebook and Twitter pages. I think we had a couple hundred followers on each platform. Today the Facebook page for the Mac has grown to over 7,200 fans and over 1,800 Twitter followers. The Facebook numbers alone put the Mac in the top three sailing events for FB followership. Those numbers explode during Mac Week, resulting in web visits over 380,000 and Facebook traffic in the 2.2 million-visits range. Those are a lot of eyes and representative of the power of social media. Q: Might the day come when you also become a dealer for Beneteau powerboats? A: Yes. It completes the brand for us and we know the intricacies of the local market well. It would be a new venture for us, but a calculated one. I think that Beneteau America knows that we are huge brand advocates on Lake Michigan.